MouseSavers readers get the best available rates plus exclusive extras at the Embassy Suites Orlando on I-Drive near SeaWorld and Universal Orlando! You’ll receive the best available changeable/refundable rate, plus FREE in-suite wireless internet ($9.95/night per device value), and a MouseSavers exclusive 20% off coupon for lunch and/or dinner in the hotel’s Fisheye Grill restaurant. See below for details. 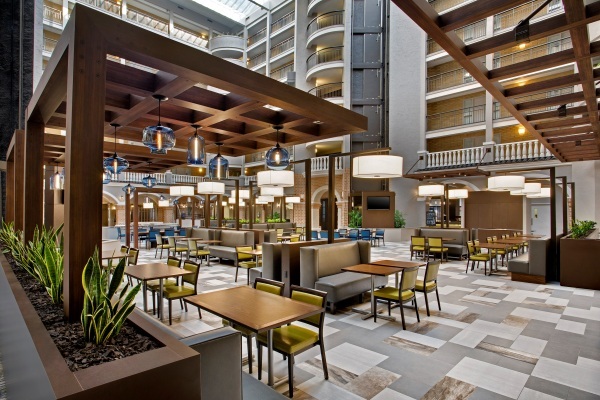 If your plans include visiting Universal Orlando, SeaWorld, or Legoland Florida, checking out the new Orlando Eye 450′ observation wheel, Madame Tussaud’s or SeaLife Aquarium, or shopping at the various malls and outlets in the Universal area, including the Premium Outlets International Drive, we highly recommend the Embassy Suites Orlando (International Drive South), located at 8978 International Drive. A recent addition to MouseSavers Preferred Hotels, this newly renovated 1-bedroom suite hotel offers extra room, FREE cooked-to-order hot and cold breakfast, FREE evening reception with complimentary beverages including beer and wine, FREE shuttles to Universal Orlando and Walt Disney World and much more. The hotel provides comfortable 1-bedroom suites situated around a chic contemporary atrium, and is conveniently located in the heart of International Drive near the Orlando Convention Center. That makes it extremely convenient to both Universal Orlando and SeaWorld (7-9 minutes drive to either, or take the hotel’s FREE shuttle) and easy walking distance to lots of other dining, shopping, and entertainment destinations, including the pickup point for Legoland’s daily shuttle. If you do want to visit Walt Disney World while staying here, it’s only a 15-20 minute drive on I-4 to the Disney parks, or the hotel offers a FREE shuttle. Although this is a convention hotel, it’s very family-friendly and offers many of the amenities and leisure services that you would find at a family resort hotel. Spacious two-room suites range from 452 – 493 square feet and feature a separate living room with a sofa bed and private bedroom with two double beds or one king bed. All suites have two 32″ LCD flat-screen TVs, a wet bar with a refrigerator for your favorite snacks, a microwave and a coffee-maker. High speed wireless internet is available in all suites. If you are traveling with young children, cribs, high chairs and playpens are available on request (advance requests are recommended). If allergies are an issue for anyone in your family, the hotel has 12 hypoallergenic PURE suites available with improved air quality. A PURE suite is an allergy-friendly alternative which has been treated with a comprehensive process to eliminate most irritants for travelers with increased sensitivity to allergens. Guests receive an extensive FREE cooked-to-order hot and cold breakfast each morning, with omelets, breakfast potatoes, eggs and bacon or lighter choices like fruit, oatmeal and pastries. If you are in a hurry to get to the parks, you can also enjoy a bagel and coffee to go. There is a nightly reception in the atrium lobby where you will find FREE beverages, including beer, wine, select liquors and sodas, and light snacks. Adults and kids are welcome. Bar Meets Grill, the hotel’s new on-site restaurant, has a casual, pleasant atmosphere and serves lunch and dinner from 11:00am – 11:00pm, and provides room-service dining as well. 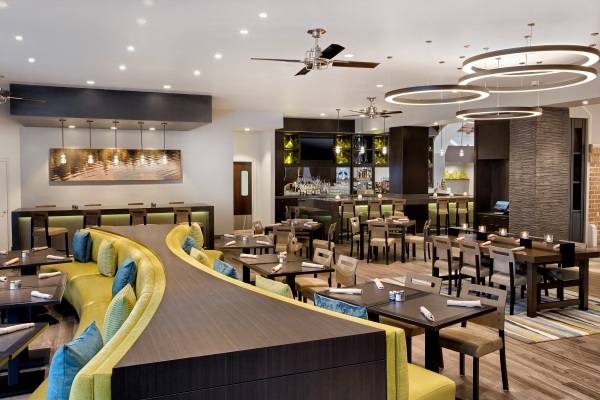 The Florida-inspired menu features seafood and American cuisine. There are numerous other dining options nearby; restaurants within a block of the hotel include Yard House, Red Robin, a brand new Shake Shack, BJ’s Restaurant, Chuy’s Mexican and a Del Frisco’s Steak House. It’s an easy walk to Bahama Breeze, Capital Grille, Maggiano’s and even a Friendly’s ice cream parlor; and a short drive or cab ride takes you to the excellent “restaurant row” on Sand Lake road, where you can find many of Orlando locals’ favorite restaurants like Ocean Prime, MoonFish, and perennial MouseSavers favorite Seasons 52. For other suggestions, dining discounts, coupons and printable deals, click here. There is an on site fitness center, and both an outdoor and indoor pool, in case you need a respite from the sun or want to swim during the cooler weather. The lobby has a concierge desk, as well as a Budget car rental desk, ATM, gift shop and on-site convenience store. Coin-operated laundry machines are available, as are laundry and valet services. Self-parking is $15. If you need to catch up on email or do some work during your stay, there’s a comprehensive business center on site as well. If you prefer not to drive, there are FREE scheduled shuttles to the Walt Disney World theme parks, Universal Orlando, and SeaWorld Orlando. The shuttles are perfectly adequate to get you to and from the parks, but there are just a few scheduled trips each morning and a few in the evening. If you want more flexibility or like to take a break in the middle of the day, we recommend renting a car. If you’d like to explore the extensive shopping, dining and entertainment venues along International Drive, you may want to try out the I-RIDE Trolley. This convenient bus service operates from 8am to 10:30pm daily and runs throughout the International Drive Resort Area. Trolleys run every 20-30 minutes, and you can hop on and hop off anywhere along the routes. This is an inexpensive way to get to SeaWorld, or the Orlando Premium Outlets, and saves you the hassle of parking, although you may want to plan on extra travel time – it makes many stops along the way. MouseSavers readers get the best available rates plus exclusive extras at the Embassy Suites Orlando on I-Drive near SeaWorld and Universal Orlando! Please Note: If you came here from a MouseSavers newsletter or Hot Deals, you must use the links in that newsletter to get the special newsletter offer. You will receive the best available refundable/changeable rate at the time of booking on the room type you choose. Plus, the rate includes FREE cooked-to-order hot and cold breakfast, evening reception with FREE beverages and light snacks, and FREE scheduled shuttle service to the Walt Disney World theme parks, Universal Orlando, and SeaWorld Orlando. Book this special MouseSavers offer for Embassy Suites Orlando on I-Drive near Universal Orlando and SeaWorld! *You must book this offer online. Rates listed above are for a standard 1-bedroom suite with one king bed. Double/double-bedded suites may be slightly higher. Rates are subject to availability and blackout dates (when the MouseSavers rates are not available) may apply. Rate does not include 12.5% tax. This offer cannot be combined with other offers or discounts, and may not qualify for Hilton Honors points or miles. Room rate is refundable/changeable up until 72 hours prior to check-in. Self-parking is $15. At check-in, guests will receive a 20% off dining coupon for use in the hotel’s Bar Meets Grill restaurant. Coupon is good for the length of your stay and includes food and beverages (excludes alcoholic beverages) purchased and consumed in the restaurant. In-suite or room service is not included. Restaurant is open for lunch and dinner from 11:00 am – 11:00 pm. For other terrific special offers for this hotel available only to MouseSavers subscribers, sign up for the FREE monthly e-mail MouseSavers Newsletters and extra Hot Deals—it costs nothing to be a subscriber!